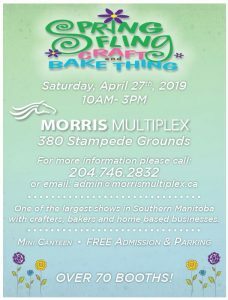 Join us for the 2019 Spring Fling Craft & Bake Thing on April 27th, 2019. This show started in 2015 where we found a interest for the spring show as our fall show has grown in the last few years. Please CLICK HERE for the application. To be considered for the show, the application and payment must be handed in. NEW IN 2019- A photo of the application will no longer accepted. Please send the application by email (as an file attachment), fax or drop off at the Multiplex Office. We accept cash/debit at the Multiplex office, cheque- payable to the Morris Multiplex. Unfortunately, we do not accept e-transfers, visa debits or american express. When the application and payment are received an email will be sent regarding your application. If you are accepted into the show the payment will be processed at that time. 3 booths available at this time. For additional questions please contact Chelsea Gauthier by email at admin@morrismultiplex.ca or by phone at 204.746.2832. Suzanne Harker selling Bath bombs, soaps and shaving butter.